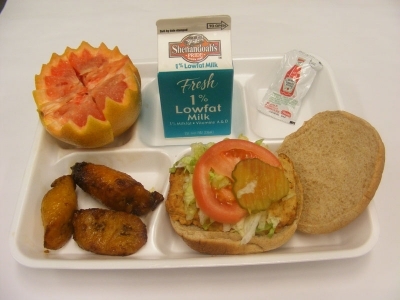 Contents: Chicken sandwich (wheat bun, tomato, lettuce, pickle), chicken wings, half a grapefruit, 1% milk, and ketchup. Notes: Grapefruit? Seems odd. Also, chicken sandwich paired with chicken wings? Are you sure they're chicken wings? They almost look like fried plaintains, yum! Although that would be a little unusual for a school lunch, depending on the region. Those are definitely plantains. My students have them for lunch all the time. those are friend ripe plantains! They look like potato wedges.